If there’s one thing that unites almost everyone concerned with health and social care services it’s the fear of being sued. Otherwise rational and courageous workers have been reduced to quivering wrecks at the mere suggestion of litigation or the slightest suggestion that they might have failed in or ‘neglected’ their duty of care. Duty of care is such a preoccupation for workers that it crops up daily in conversation and in practice whenever we encounter ‘thorny’ issues relating to ‘health and safety’, ‘rights and responsibilities’, ‘freedom of choice’, ‘confidentiality’ and a host of other topics. What all of these conversations have in common is ‘duty of care’. However not everyone who hears the term understands what it means or indeed where it comes from. This is a shame because as we all know knowledge is power and one way to know about something is to know a bit about its history and development. Lord Atkin delivered a judgement in the House of Lords on August 26th 1932, thus ending a legal battle that had gone on for four years. The judgement became what is known in UK law as a ‘binding precedent’ because (with the exception of the new Supreme Court) no other UK court has the authority to overrule the principle that comes from it. This is the principle that most Duty of Care decisions are based upon. What is this principle that was so important it still affects us today? We’ll get to that. First let me tell you the basic facts of the story. May Donoghue was a shop worker in Paisley, near Glasgow who, one Saturday afternoon went with a friend to buy an ice cream float at Frankie Minghella’s café. As it turned out Mrs. Donoghue didn’t pay, her friend did – and this is significant. Having finished most of her ice-cream float she discovered the partly decomposed carcass of a slug in the bottom of the bottle that had contained her drink. She was later treated for gastro-entiritis (presumably as a direct result of consuming some of the corpse). Mrs. Donoghue’s next move was to sue the owner of the café. However the café owner, Mr. Minghella argued that his only duty of care was to the person who bought his goods and since Mrs. Donoghue had not paid herself there was no legal case to answer. Not to be deterred Mrs. Donoghue turned her attention to Mr. David Stevenson whose company had manufactured and bottled the soft drink in question. 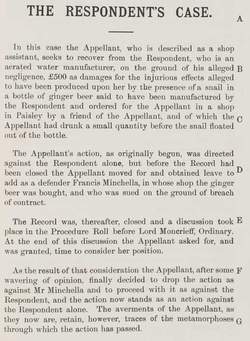 The argument was that Mr. Stevenson had a duty of care to the people who used his products in the end – however far removed they may be from his own bottling and production plant. Lord Atkin’s ruling was that Stevenson was responsible and stated in the ‘Obiter Dicta’ (legal jargon for ‘last words’ that explain the judgement) that we all have a legal responsibility not to injure our neighbour. In other words we all have a legal duty, ‘a Duty of Care’ to consider the effects of our actions upon other people who may be affected. In health and social care this basic principle includes following the various rules and legal obligations that surround our work. That’s the principle of this case: Donoghue v Stevenson 1932. However far removed we might be from the face to face ‘frontline’ of clinical practice we all have a duty of care to ensure that our practice is safe and reasonable.